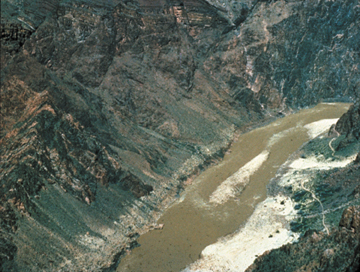 The Colorado River cuts through sedimentary layers up to 2 billion years old in the Grand Canyon. A recent book, however, being sold in the Grand Canyon National Park, is sparking a national debate by taking a creationist view and saying the feature is only 6,000 years old. Image copyright U.S. Geological Survey. But a book sold at the parks bookstores since last fall says the canyon is merely 6,000 years old and was formed by Noahs flood, as described in the Bible. Compiled by a Colorado River rafting guide, Grand Canyon: A Different View was placed on shelves alongside science books and other interpretive histories of the canyon. The book has provoked a new round in the national debate about biblical creationism and the separation of church and state. The Grand Canyon Association, the nonprofit organization that operates the national parks bookstores, chooses the books that are sold on the shelves, and the National Park Service (NPS) approves the list. The parks Web site sells this book under the natural history section, alongside more scientific books; however, it describes the book as a creationist view of how the Grand Canyon came to be. Selling the book in the national park could be an implied imprimatur from the NPS, says Wilfred Elders, professor emeritus of geology at the University of California, Riverside. Elders helped reopen this debate by writing a scathing review of the book in the Sept. 23 Eos. Robert Gropp, senior public policy representative of AIBS, says that their concern is how science is presented in the park, and how science materials are being distributed so as not to confuse the public. David Barna, chief of public affairs at NPS headquarters in Washington, D.C., says it is important to make a distinction between items in a bookstore versus educational materials in a parks interpretive program. Most public libraries in the United States have creationist books and Native American books on their shelves, but that doesnt mean that the county school board is teaching those books in the schools and it doesnt mean that the board of supervisors endorses these views, he says. NPS staff is required to teach the latest scientific methods in explaining the formation of geologic features, as do visitors center films and trailside exhibits. We are not getting away from teaching science  thats what we do. But while were out there giving these geology lectures, we must recognize that people have their own beliefs, Barna says. Despite varying reports suggesting that the book was originally shelved under the science section, Barna says that the book was always in the inspirational section of the bookstore. Although he says that the review process will take some time, he anticipates a decision soon about the issue of religion and science in NPS bookstores. Were trying to find some compromise thatll satisfy both sides, Barna says. Elders endorses the establishment of guidelines to prevent the promotion of pseudo-science in national parks. The Holocaust Museum in Washington, D.C., does not sell books that deny that the Holocaust ever occurred because such books are pseudo-history. This book is an extreme example of pseudo-science, he says.